Walt Disney's early years were no bed of roses. He had to fight for everything that he achieved. If he wasn't fighting with his own animators, he was fighting with his critics, and if the critics were happy, then he was fighting with the unions. 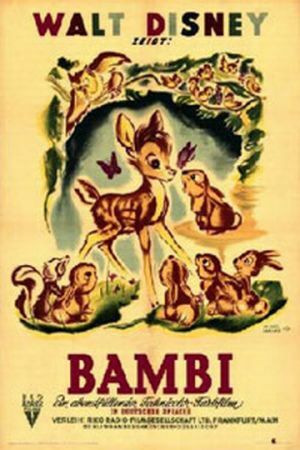 With Bambi (1942), things hit a new low: he even wound up fighting with his own 8-year-old daughter, Diane! When a children's animator can't even please his own child, he's in trouble. Walt survived the controversy swirling around this film, but it taught him immensely valuable lessons that he never forgot. 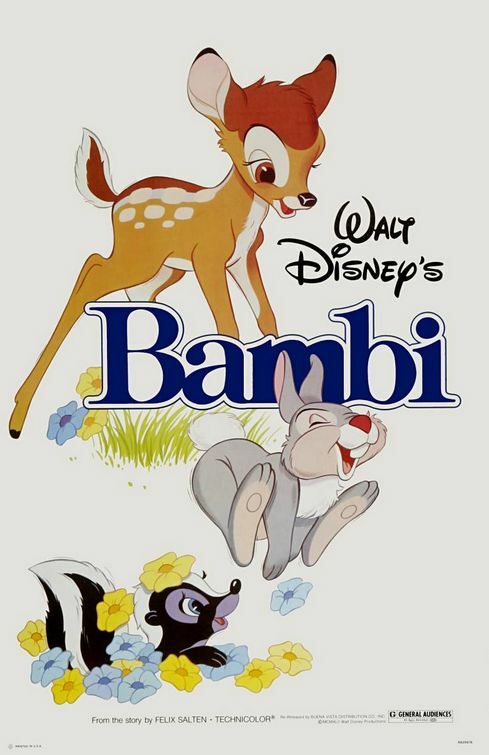 Bambi (Hardie Albright and Donnie Dunagan) is a white-tailed deer born to the Great Prince of the Forest (Fred Shields) and his unmarried consort. He is to inherit his father's title, given to him for guarding the woodland creatures from the predations of man. He has a spunky young friend, the rabbit Thumper (Peter Behn, Tim Davis, Sam Edwards), who helps him learn the basics of getting around. 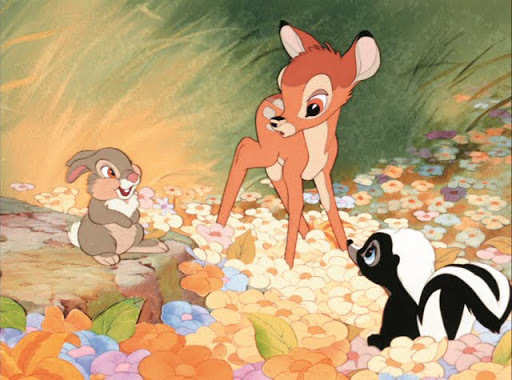 His other friends include the skunk Flower (Stan Alexander, Sterling Holloway) and the female fawn Faline (Cammie King Conlon, Ann Gillis). Bambi loves his mother very much and spends most of his time with her. When Bambi gets too curious about the outside world, she tells him it is full of danger and that he should stay where it is safe. One winter's day, his mother is shot and killed by an unseen hunter. By the next spring, Bambi has matured into a young stag. Friend Owl (Will Wright) warns them all against "twitterpation," or falling in love. Thumper and Flower soon find mates, and it appears that Bambi and Faline might be happy together, too. Unfortunately, a fierce stag named Ronno appears and wants Faline for himself, but Bambi fights to keep Faline. She later gets cornered by hunting dogs, and Bambi must again prove his manhood if he is to save her. Nice to meet you, Flower! Naturally, the plot point that sticks out is the part about "his mother is shot and killed by an unseen hunter." This is the most controversial incident in all of animation, and perhaps all of film. The outrage at this twist was immediate and vociferous from all sides: sportsmen, critics, plunging box office receipts, and, most worrisome of all, Walt's daughter. She hated it. 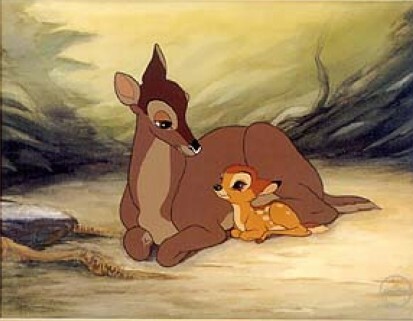 In fact, the book on which Bambi was based, "Bambi: A Life in the Woods" by Austrian Felix Salten, did indeed have Bambi's mother die. 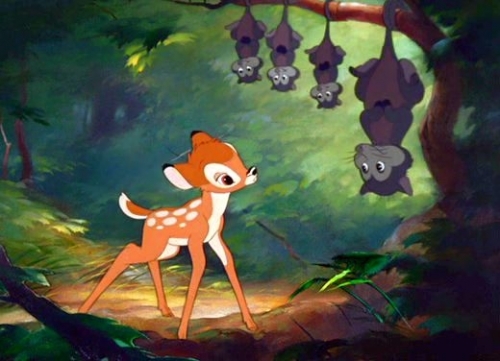 Disney, though, had changed other elements of the story to suit his needs, such as Bambi's species of deer, so his protestations fell a little flat. With World War II at its height, foreign revenues were cut off, and Disney had to shorten the film to cut costs. It lost money anyway, just as had been the case with "Fantasia" and "Pinocchio," and did not turn a profit until re-releases started happening regularly in the post-war years. 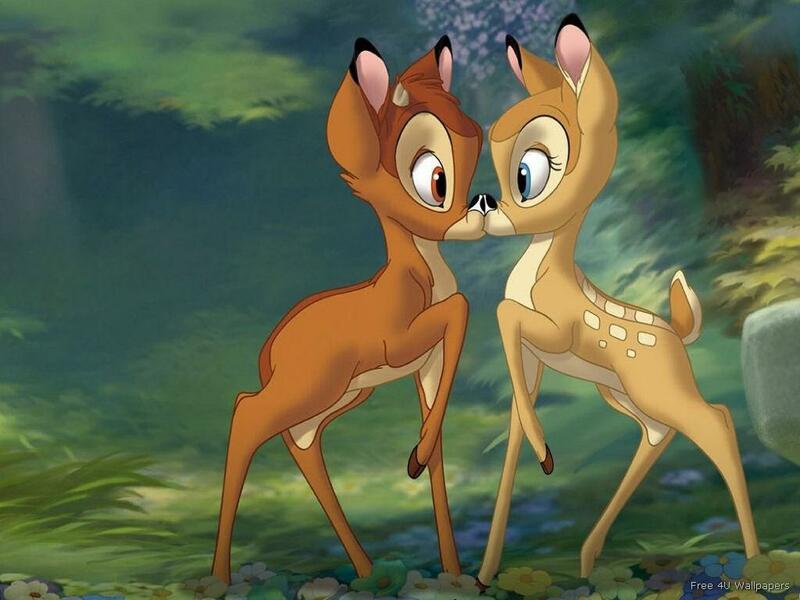 The animators were very careful to learn as much as they could about deer, and it shows in their artwork. 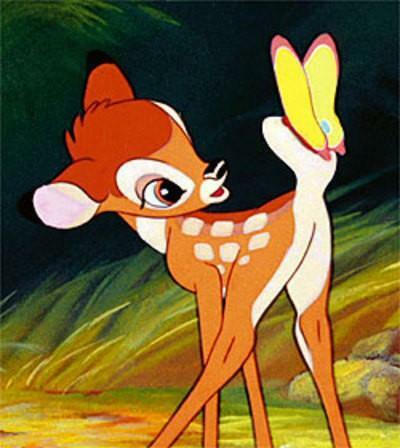 Supervising Director David Hand had two different artists work on Bambi, one (Rico LeBurn) doing a realistic version of a deer, the other (Marc Davis) softening it to make it more baby- and human-like. 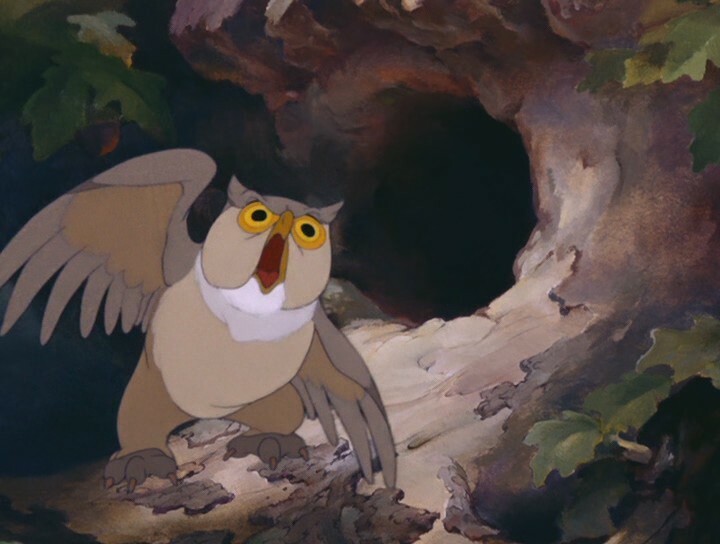 A Chinese animator, Tyrus Wong, designed the backgrounds in an impressionistic way that increased the amount of detail in the center of the frame, cleverly drawing the eye toward the characters standing in the foreground. Despite all of its problems and the negative initial reception, the film's popularity has only increased over the years. It now is considered one of the greatest animation films of all time, on a par with "Snow White and the Seven Dwarfs" and "Sleeping Beauty." The film's impact is immense, and the score alone (by Frank Churchill) has influenced artists including John Williams. Paul McCartney claims the film had a profound effect on his beliefs about animals, and, indeed, the film was decades ahead of its time in its depiction of the need for forest conservation. The characters of Bambi and his mother have appeared in Public Service Ads several times over the years, and they remain iconic figures representing innocent wildlife. Donnie Dunagan holding a recent fan letter (May 2017). "Bambi" is still viewed and appreciated, and there is solid proof. 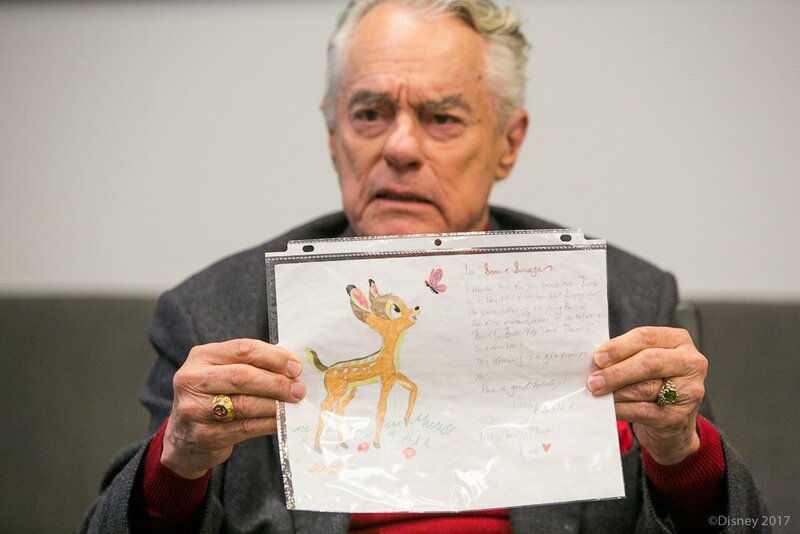 Donald "Donnie" Roan Dunagan, who voiced young Bambi, was born in 1934. He's now 82 years old and was a US Marine Corps drill instructor, but the voice work that he did as a child has never left him. As of this writing, in 2017, Dunagan says that he still receives letters from young fans at least once a month. What are we doing? Just hanging around. As opposed to what are commonly derided as "mere fairy tales," "Bambi" is one Disney film that shocks in its realism. 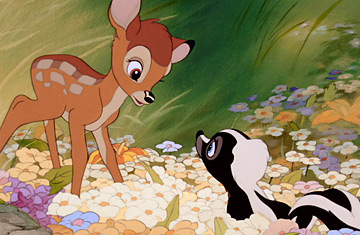 The sudden death of Bambi's mother probably has caused more nightmares than any other moment in film history. Ultimately, that is what turned the film from another innocuous (and, incidentally, profitable right away) "Dumbo" into a legend (that continues to make good money for Walt's heirs). 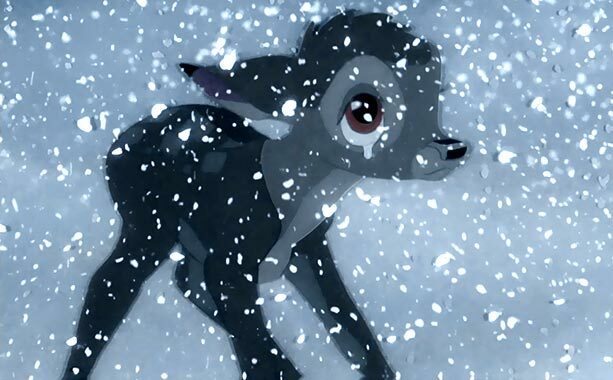 People still talk about the death of Bambi's mother as one of the most shocking things they've ever seen in film, and it truly does disturb because it is so unexpected and pitiless. It is difficult to make moviegoers feel real emotions, and Disney sure pulled that off with "Bambi." Walt later had a fine opportunity to prove that he had learned his lessons from "Bambi." While developing Rudyard Kipling's "The Jungle Book" some twenty years after "Bambi," one of his story people wanted to keep dark elements of the story intact. When Walt told him to make it lighter and cheerier and the man refused, Walt took him off the project. The man's successor did as requested, lightening up the tone and changing the project into a fun musical with upbeat songs. "The Jungle Book" was a huge success, no doubt helped by the learning experience that was "Bambi." Every child should get to see "Bambi." The real world is never far away, and it is only fair to learn that good exists with evil, and that life does not always turn out perfectly. 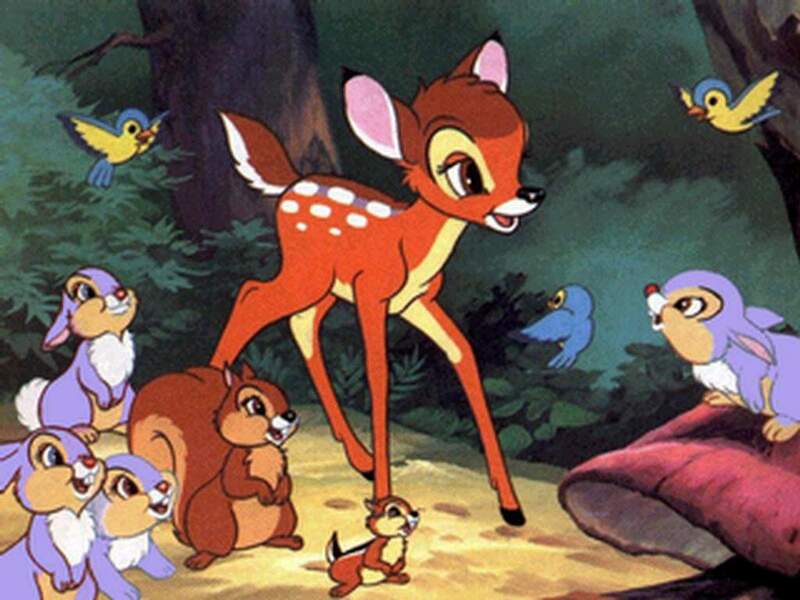 Children are better able to handle things like "Bambi" than we think. The characters otherwise are delightful, and the only real complication is that they all fall in love - and that can't be bad. Watch "Bambi" when you can with your child and then name their pet rabbit "Thumper," it will be a memory you'll never forget. This is my own personal choice for oddest moment in any classic Disney movie.